Remembering World War I which was known as The Great War up until World War II, 100 years ago. 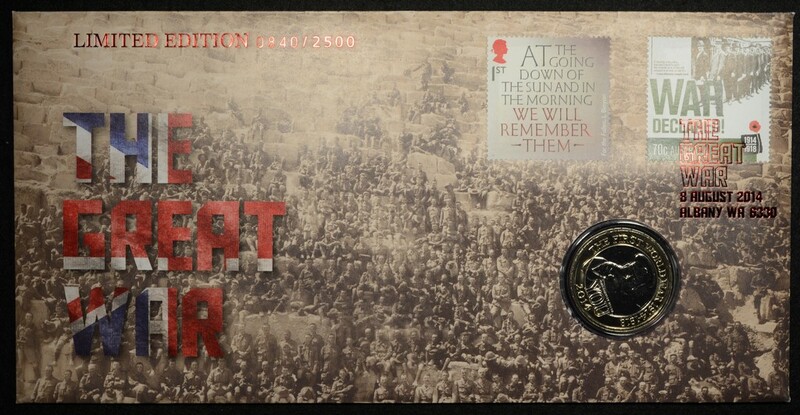 The Great War PNC marks the centenary of the outbreak of war and is limited to 2,500 individually numbered covers with a special red foil postmark. Issued by Australia Post on August 8th there will only be 2,500 of these PNC’s issued worldwide. 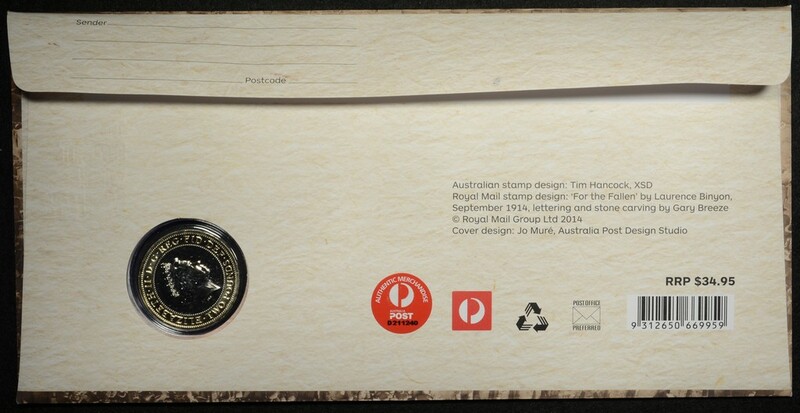 The PNC is a tri-fold presentation card which contains the coin in a built in capsule housed in an envelope with a Royal Mail 1st Class stamp and an Australian 70c stamp with a red foil cancellation postmark of Albany WA. Albany was where our Aussie troops departed Australian soil on November 1 1914. The commemorative coin is a British £2 2014 issue struck on a bi-metal planchet. The inner core is made from copper-nickel and the outer ring composed of nickel-brass. The uncirculated coin is edge inscribed with “The lamps are going out all over Europe”. The reverse of the coin features Lord Kitcheners call to arms “The First World War 2014-2018 Your country Needs YOU” designed to the coin by John Bergdahl and the obverse features Elizabeth II by Ian Rank-Broadley. This British commemorative coin is the first in a five year series remembering outbreak to armistice.